Open daily from 8am to 6pm be sure to take a trip inside the doors of Shoda Market Café and sample the menu for yourself as we guarantee you won’t be disappointed. 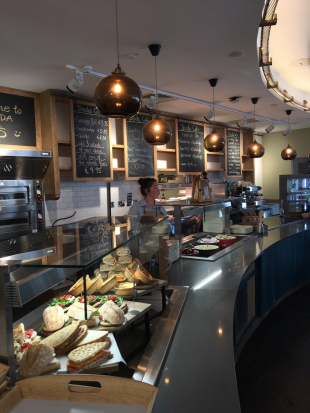 This week see’s the newest eatery in Maynooth open its doors as the Glenroyal Hotel have now added a 120 seater café to its growing repertoire where you can enjoy a delicious and healthy breakfast and lunch along with a specially selected bottle of wine. Currently open for breakfast and lunch you can now enjoy a healthy alternative to your meals in the comfortable and stylish setting of the Shoda Market Café. Located to the right of the Hotel the space has been transformed to provide a relaxed contemporary theme which is bright, spacious and very welcoming. Serving breakfast from 8am you can enjoy a classic range of options including eggs benedict and fruit salad bowl to smoked salmon with scrambled eggs and more. Lunch time starts from 11:45am and is another great time to make a visit as you can choose from a wide selection of options from freshly made soup, superfood salads, and hot dishes. Freshly made to order the selection available is continually growing from their trained chefs to provide you with the best quality meal at a cost effective price. Setting Shoda apart from other cafés is their exclusive range of tea, coffee and wines. You can enjoy their specially crafted artisan blend of coffee while relaxing in the café or have it to-go if you are on the move. The carefully blended grounds captures the flavours of a variety of beans together in one cup to keep you supercharged for the day. They also have a specially selected range of teas which are locally produced and will go down a treat alongside your meal or their homemade treats. One of the exciting features of the café is their exclusive selection of wines which they have hand chosen (and carefully tested) from the vast wine regions across Europe and afar. Enjoy a glass of wine at lunchtime alongside your meal or purchase a bottle to take home and enjoy, with advice on hand to help you select the perfect accompaniment to your meal. Only recently opened there is still a lot more to come from Shoda Market Café with plans to cater as the go-to destination for your evening meal and also to serve you from their very own bakery where you can enjoy freshly baked specialty breads and more.